These majestic beings will mark the last customs of the year from me. I wanted to go out with a bang this year. And after all the struggles I’ve had with my over loaded mind and being ill for about two months straight, I wanted to let my hands and mind do whatever they wanted. No holding back in any way or form. It’s very rare that I have time to work on something as detailed as these two. It has truly been a blessing and a treat to my mind and soul. Now there’s still an awful lot stuck in my head, but I can breathe again. As for next year I will be working on more big projects like these. It is my first year running as a business and the first year that Tomodachi Island has meant a great deal to our finances. That is why it has been so stressful. I have hit new highs and new lows this year, but it is all a learning curve right? Next year will be much more structured. There will be allot of small pieces in bigger batches but also room for big beauties like these. Most of the time I haven’t decided on the colour schemes of a custom until I actually start painting it, and I’d say that 95% of the time I end up going in a completely different direction from what I originally planned. I had so many colours in mind for the Wind Elemental. Since the sculpt is so complicated a mix of too many colours could have ruined it though. So I went with a really soft blue gradient with white and brass details to give it that almost angelic look. I’m so proud of it! This is where I really had to put myself out of my comfort zone… When I had finished the water and all the blue tones, it was all just too…..blue. I felt really lost to be honest. But as I have drawn, painted and tattooed a million Japanese inspired tattoos, the answer was just around the corner. I haven’t painted a peony in so many years now though and it was quite daunting to paint something like this again. I have just gotten so used to sculpting everything these days. It was like a whiff of fresh air though and made the whole piece pop. Definitely the cherry on top of the cream. I’m guessing you want to know where and when you can get your mits on these beasts now?! 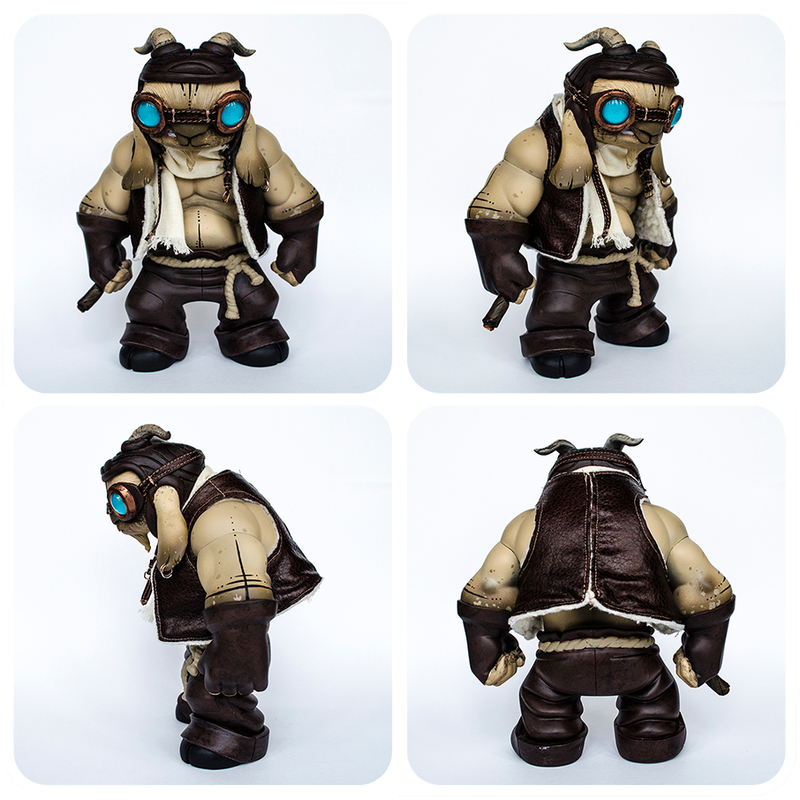 Well as per usual they will be available at my Big Cartel Store this Thursday 13th of December at 4.00 PM London Time! Preview is available now, so head on over and have a little looksie! I also want to take the time to wish you all a Merry Christmas and a Happy New Year! I am signing out for 2018 and am looking forward to a crazy 2019 with so many awesome things happening that I just can’t wait to tell you all about! 2018 has been sooooooooooooo good! But 2019 I am convinced will be my best year yet! Thank you all for your continuous support, without you I would be nothing!!!! I love all the collaborations I’ve been able to do this year. I contacted Mark Nagata a while ago. This was after giving myself a kick in the but to stop being scared of getting turned down and start approaching the people I look up to the most and would love to work with. Now Mark is a legend to me and I was terrified to contact him. Turns out he’s one of the most approachable people out there and just a really loving person, and he said YES! Guess if I was over the moon!!! I finished the first two a long time ago, but having other jobs to finish in between put them on a back burner and that was very frustrating. Many times I just don’t get to choose what mt jobs will be. I just have to take the jobs that generate money quickly first. Wish it didn’t have to be that way, but that is the down side of doing this as a business. I might be my own boss in many ways, and that is great, but wow it can be hard. Sometimes I wish I just had someone that could tell me what to do next rather than having to decide myself. I got to finish them yesterday finally which obviously is a great relief and now they will be up for grabs in my Big Cartel Store on Thursday! By now I think you would have noticed how much I love working with gradients. And when I do series (even if the don’t end up on the same shelf) I just love to see their colours almost melt in to each other. Now to the point! Like I said, Thursday the 13th of December is the DAY at 4.00 PM London Time!!! I will release them a bit earlier than usual as I am trying to accommodate everyone all over the world (which is next to impossible). I hope this new time wont mess you about to much and that you’ll still have a chance to pop by if you want to pick one up. Oh I’m so excited to present my very first collaboration to you guys! I made it my mission this year to approach as many people, that I admire, as possible. Kurobokan was on my list but came to me before I had a chance to come to them! This gave me a massive boost and I was so excited to receive six little Sleepwalker Offspring’s in my letterbox one day! I mean come on, how darn cute are they?!?!??!??? I received them a while ago and have been so eager to get them painted, but I had many other jobs to finish first. This weekend I took two days rather than just one to work. I have allot on at the moment, and no I am not complaining! I am super happy with all the work I get, so don’t get me wrong. I couldn’t even have dreamed of some of the things I’ve got going on! But since time is short on my hands it can also be very stressful. Being creative constantly does take a toll on you weather I’d like to admit it or not….. But that is a story for another time, now I just want to show you these little bundles of joy and be very proud of what I’ve accomplished. So here goes…..
My main objective was to create a nice gradient not only on each individual piece, but I wanted them to look like a gradient standing next to each-other too. So I started with spray painting them in the scale I thought would look nice. I tend to stick to certain colours that appeal to me and pink is something that is always reoccurring in my creations. It’s just such a beautiful colour and it really works with everything! I tend to stay away from black however, but since it was the best contrasting colour to white I had to get out of my comfort-zone and go black black black…. Might do more of that in the future. Black is after all my favorite colour to wear, so I shouldn’t really be as affraid of it as I am…. maybe? Either way, I feel very honored over the opportunity to work with Kurobokan and hope that we can do more amazing collaborations in the future! Now to the part which I’m guessing you’re a bit more interested in! Where and when can you get hold of one. 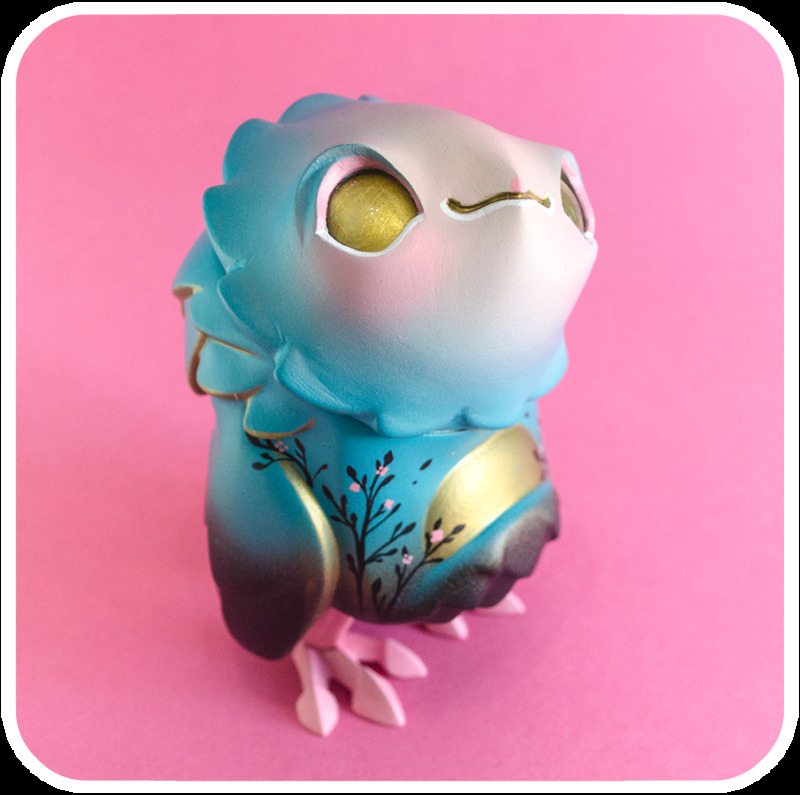 Well as per usual they will be available from my BigCartel Store on Friday the 28th of September @ 9.00 PM BST! They will be priced at £130 with Free World Wide Shipping of course! Previews are up now! First of all, I am so sorry about the lack of Blog Entries this year. Seems I’ve really fallen behind on that part. But on the other hand, I’ve been able to create some amazing customs this year, and I promise that when time presents itself I WILL sit down and write about them all. Now, this one, this one I just had to post as I think it’s one of my best customs this year. I struggled so much with the original platform by Jermaine Rogers. Don’t really know why, but I found it hard to envision what it could become. So I used a different approach this time. Rather than making a creature I’d thought up in my head I just started “sketching” with sculpey and slowly his character became more and more clear to me. The Toketsu Mountain Tigers roam the snow covered mountains of Toketsu. They are very large creatures with bad vision. With the bad vision and those tall legs they often get themselves into some tricky situations. This one managed to step right trough the roof of a Galaxy Bunny Burrow. The Galaxy Bunnies burrow into the mountain and this is where they spend most of their days. Even though the inside of the Toketsu mountain is an adventure of its own, it can get a bit dull when you get used to it. So naturally when something unexpected happens, like a huge furry foot coming through the roof of your house, it needs to be inspected. Now being a huge tiger with bad eye sight, suddenly covered in little starry critters can be pretty daunting as you can see by his expression… Maybe we get to follow the story of these four a little closer in a near future…. 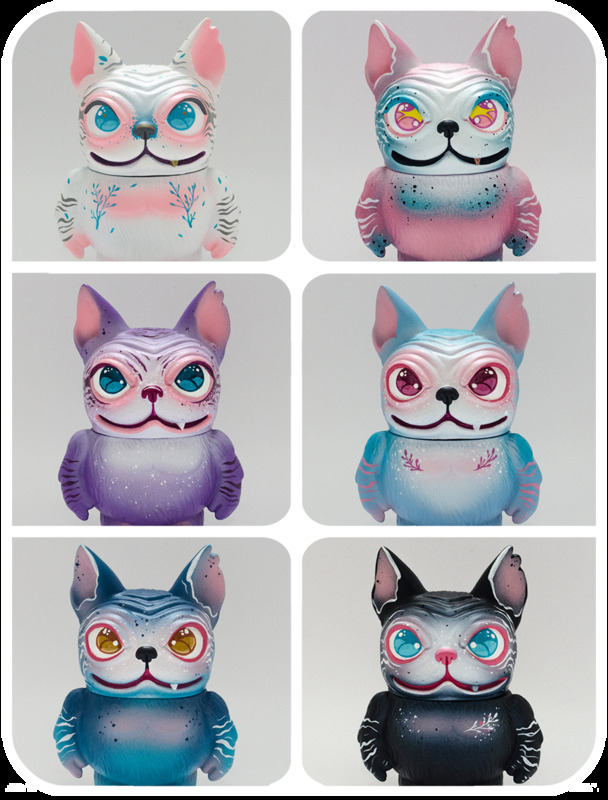 The Toketsu Montain Tiger and his starry friends is currently on his way to NYC to participate in the show “Falling Apart” which is curated by Martian Toys. It’s a big custom show with the Jermaine Rogers platform as a base. I think it will be an amazing show and I have seen some pretty mind blowing customs so far. So if you have the chance to participate on the 4th through to the 7th of October I can highly recommend that you go and see them in person. NYCC booth 488, Martian Toys! Hey guys and galls! It's time for my very first Custom Omen Mini Series! Wohoooo! I've had so much fun getting back in to molding and casting. Spent allot of time casting during my holiday in Wales and I can't wait till we can find a house and I can set up a proper work-shop where I can work more with casting and by doing so give you more opportunities to own one of my creations. Finding a house has proven hard though, but I am convinced our future home is out there somewhere! Anyway, back to these little treaures! This is Blossom, and there are three of her available as well as the rest. Yeah three of each colour way, and that's it. I've had great fun creating the colour gradients and I am constantly pushing myself to try new things. I would never had dared to use that blue on Winter Flowers face a few years back, not a chance! But taking risks also means that you can end up with something as beautiful as this. This is definitely one of my favorites as it's so different from the rest. Same goes for Autumn Flower here... I was set on the bronze tones from an early stage but I really struggled to choose a complementary colour. In the end I went for a mint green and a pistachio highlight for his face. It's really made the bronze pop and this guy looks so much better in person. It can be so hard to capture their colours and shapes on film. You just have to see them in person to appreciate them fully! I think Spring Flower speaks for it self. Definitely a colour palette I've used before, aside from the brass. I think it's got a very asian feel, almost like a silk kimono and I love that about it. All in all I'm just very pleased with all of them and I can't wait to make the rest. These guys will go on sale tonight! Yes, TONIGHT 31st of July at 9.00 PM BST! In my BigCartel Store as per usual. And they will be ready to ship during September at some point. Love you all, and thank you for your continous support! 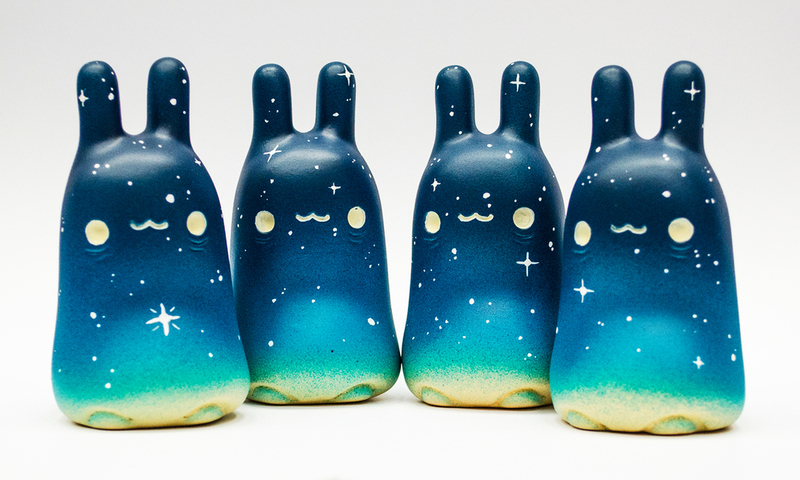 I've finally taken the opportunity to customize one of my most favorite designer toys, and not only one, but SEVEN Omens! I could not help myself when Coarse released the "Omen - Help!" series. They were just screaming out to me to be customized! The plan was to have these finished before Christmas (!) Yeah that didn't happen did it! I am to much of an optimist, or was, that is. I have now learnt that I can not put a time limit on anything after having two kids. I have to take each day as it comes, and if I'm lucky I get to do my work one day a week. No wonder these took so long to finish. These are the most favorite platform I've worked on and they're also the customs I am the most proud of ever. I rarely value my work very high, I guess that's just part of me being very critical when it comes to my own creations, but these I value very high. My best work to date! And I'm not afraid to say so. As you can see I was inspired by the different stages of day and night. I don't find the day very mesmerizing at all, but when it comes to the sun rising and setting it takes my breath away many times. And even though the night terrifies me, I also find it extremely enchanting and beautiful. So I searched the internet for colour palettes that would suit my mysterious little bird creatures and these were the ones I chose in the end. I also wanted to add a complementary precious metal to each one of them. I ended up using gold for dawn, bronze for dusk and silver for twilight. My greatest struggle were the "Twilight's". 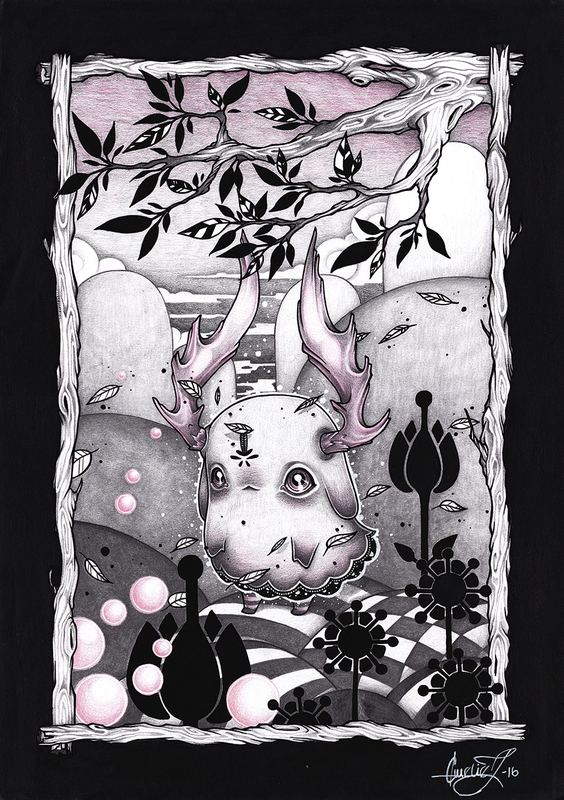 As I am used to working with brighter colours and pastels, the dark colour scheme was very daunting. The great thing about it is, that it has opened up my mind towards darker colours and I'll make sure to use them more often in the future. They look so enchanted and that wouldn't have worked without the deep dark tones. These darlings will be on sale from Friday the 23rd of March at 9.00 PM BST, over at my BigCartel store as per usual. I know that the release is further away than I normally then to put them. I wanted to make sure that everyone gets a chance to prepare themselves for this release as they've already received and awful lot of attention. All of them are up for preview with prices in my STORE. So head on over, have a look and prepare yourselves for what will probably be my biggest release of 2018! I don't really want to see them go (hahaha) but an artist and her family's got to eat too, so there we are...... I shall let them spread their wings! "In the shadows of Tomodachi Island he dwells. No one knows where he came from or who birthed him. A seemingly hideous creature hidden by the night. He carries within him a golden heart and a piece of the starry night sky. This celestial creature with his gentle soul is believed to be a creation of the ancient Gods themselves." My first sculpt of 2018! It took me long enough... But what a treat it has been. A treat to my hands and my soul. As most of you know we've had another baby, so I get very little time to do any artistic work at all. So I've decided to use the little time I've got very well. As you can see I've been focusing on fine detail and the sculpt is much more intricate than what you usually see from me. I sculpt for me now, and I will from now on. The importance of my work has never been greater to me and as an artists I am ready to grow. This sculpt gave me the chance to do so. 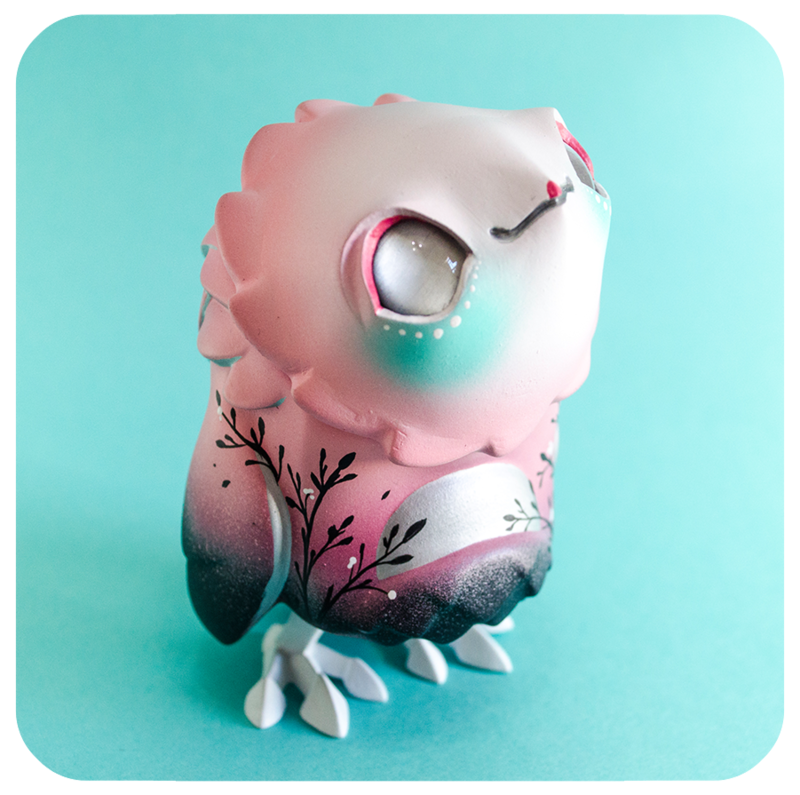 This creature will be part of the show "Misappropriated Icon" by StrangeCat Toys at Redefine Gallery, FL, on the 15th of March through to the 22nd of March, 2018. And it is part of a group show with some AMAZING artists, many of whom I've looked up to for a very very long time. I feel so proud, being part of this great lineup indeed! This creature have taken many turns in my head and I re-painted him twice before I was happy with the result. At first I was inspired by the norse God Fenrir, and that is where the sculpt was born. Fenrir has a very dark story behind him though so I had to step away from that in order to fit him into the world of Tomodachi Island. I also had to change the colour palette I first planned. I wanted him to be a dark, blueish, grey but the contrast between the night sky and his fur weren't great enough, so I had to re-think. Hence the fox colouring. And I have no explanation to the stripes, they just felt like they needed to be there. Hey Peeps! So I've had a little break after ToyCon UK and I am supposed to have one allot longer but I can not keep away from my darling toys! So I thought I'd give a little mini series a go. I love fawns and thought they'd be a great first Mini series. Take a pick out of these six different colours, but there will only be one of each. Each custom will cost £72.00 with free shipping within the UK and £10.00 shipping for the rest of the world. Each will also come with a one off mini print which will be signed by yours truly. All will be shipped within 3 weeks, and no later than then 6th of July, 2017. Pre-Orders will go live tonight at 9.00 PM BST over at my bigcartel store HERE! Let's make my first mini series a success! I am so excited to do one and don't really know why I haven't done one before! A beautiful beast that is rarely seen on Tomodachi Island. He lives in the thickest and darkest parts of the woods. Here he spreads light to the creatures concealed by the darkness. He teaches those who have lost the light within them to find it again. Inspired by the Bearhead "Reborn" that I did last year. A cloudy Cloud Puff - Queen of the skies. She decides whether the sun shall shine of the rain come down. What Queen Cloud Puff decides is the helpers law. They love her more than anything and follow her every command. A gatherer of herbs and plants that can heal and restore. A druid of sorts. The Whispering Woods Medic spends his life taking care of the creatures of Tomodachi Island. He cooks up medicine and magic with the strangest of herbs. No one really knows the purpose of the Omu. Most of the time you just see them in packs sitting in trees starring into the skies. All we can say about the Omu is that it possesses one of the most beautiful bird songs in the world. Called Satyrs, but they probably aren't. 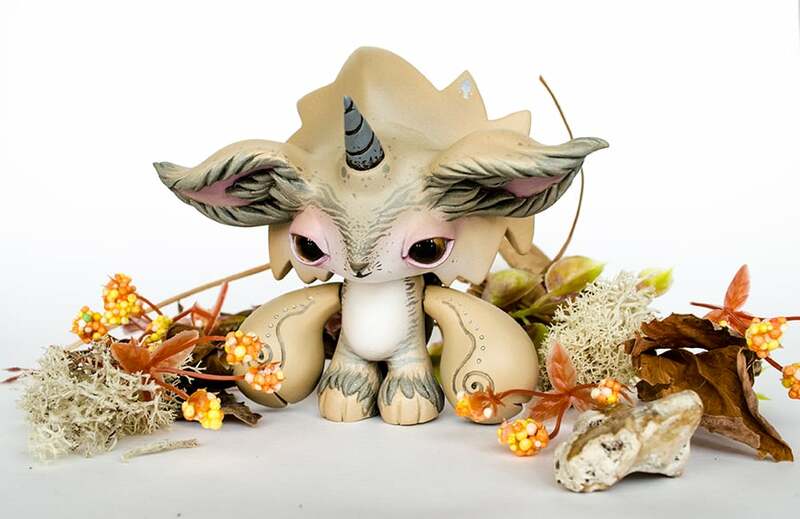 They say that they are, but this little creatures are real tricksters and those iconic horns, they're not even real.... They're pretty adorable though and they speak the strangest of languages. Called Satyrs, but they probably aren't. They say that they are, but this little creatures are real tricksters and those iconic horns, they're not even real.... Yesterday this guy found these pauldrons somewhere in the mountains and now he's convinced her's a knight. They're pretty adorable though and they speak the strangest of languages. Aki spends most of her time hiding in leaf piles. A little bit like a hedgehog. The only problem is that she's much larger than a hedgehog, and even though she thinks she's concealed, she really isn't. The bronze shell on her back is just another attempt to camouflage herself. It tends to draw more attention than anything else though. Root lost one of his eyes when he was just a little kit. He does not want to tell us how but it must have been very dramatic for him. The trees of Tomodachi Island possesses healing power however and who knows, one day poor Root might have his eye back. Until then he will remain covered in tree roots. These three go everywhere together in their little trackies. Now when they heard that they were coming with to ToyCon UK they just had to customize their tracky suits to fit in and maybe make friends with T-Con. They just love cellebs! Now Martian Toys and myself are holding the largest custom group show ever attempted in the UK and I am proud to say that three of my own Colossuses will be part of it. I will update you more about the show tomorrow along with the Tweedle-Hoot announcement. But let's just say that there are some absolutly mind blowing pieces in this group show and I feel so extremely proud to put my name to it. Thank you Aaron for making it all possible! 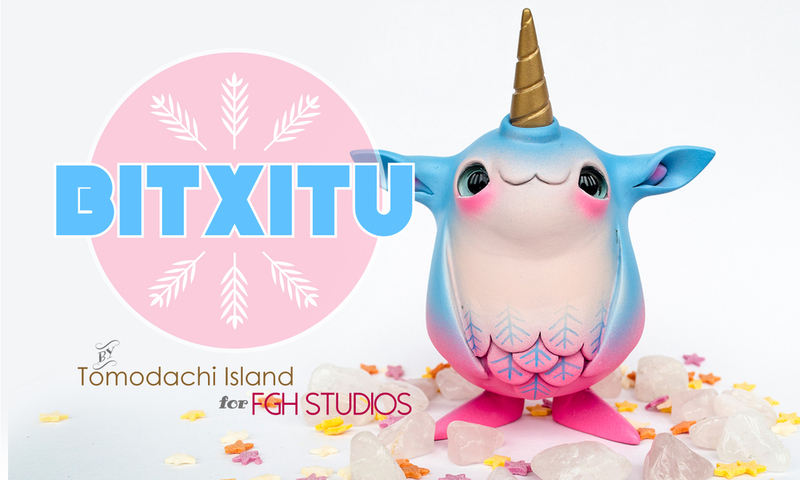 Designer Toy Awards 2016 - NOMINEE!!!! OMG THIS JUST HAPPENED! 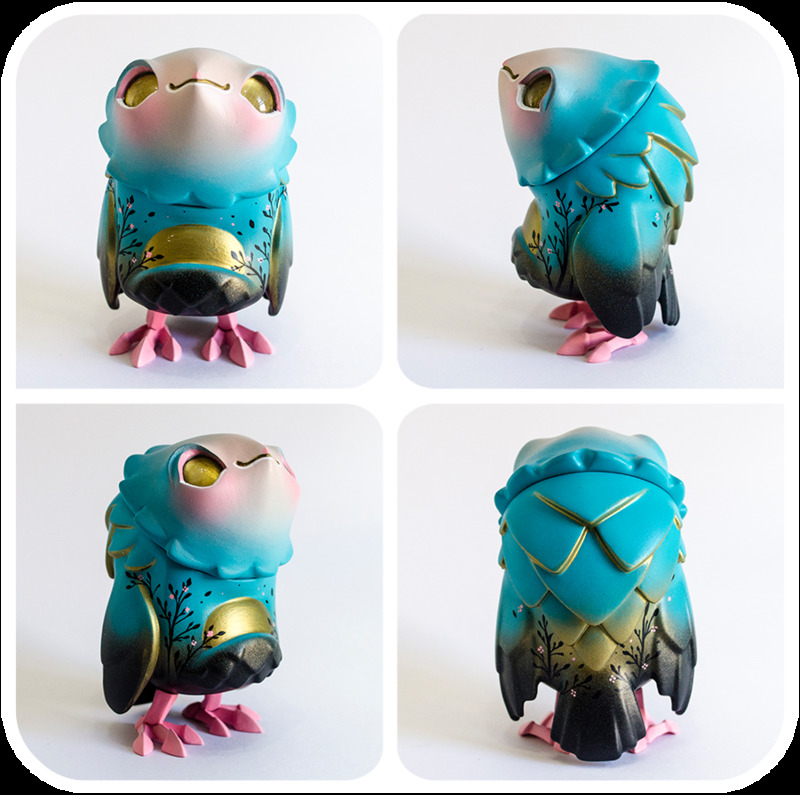 I'm a nominee in TWO categories for "Custom of the Year" at the Designer Toy Awards 2016!!! I can't express in words how happy and proud I feel right now! All the hard work that I've put in to my toy customizing have paid off! He was definitely my most popular toy of 2015 but I never thought he'd land me a DTA nomination! I want to thank all of you who took the time to nominate me! Thank you so much for your support!!!! I am nominated in the PRO Voted "Custom of the Year" and the FAN vote "Custom of the Year", and it is in the later I am going to need YOUR help! As you can see I've got some AMAZING and stunning competition and this will be hard to win, if not even impossible. BUT with your help my chances will become bigger! So head on over and cast your vote today! The voting is only open for 6 days!!! So hit the pic down below and get it done TODAY! Hey hey hey.... again! Yes the blog entry's will keep on coming cause I've got so much work to do over the next few months and so many awesome new customs. I've got so many shows on this year that I haven't got time to do my own stuff in between. I promise I'll organize next year a little bit better and try to balance things a bit more. 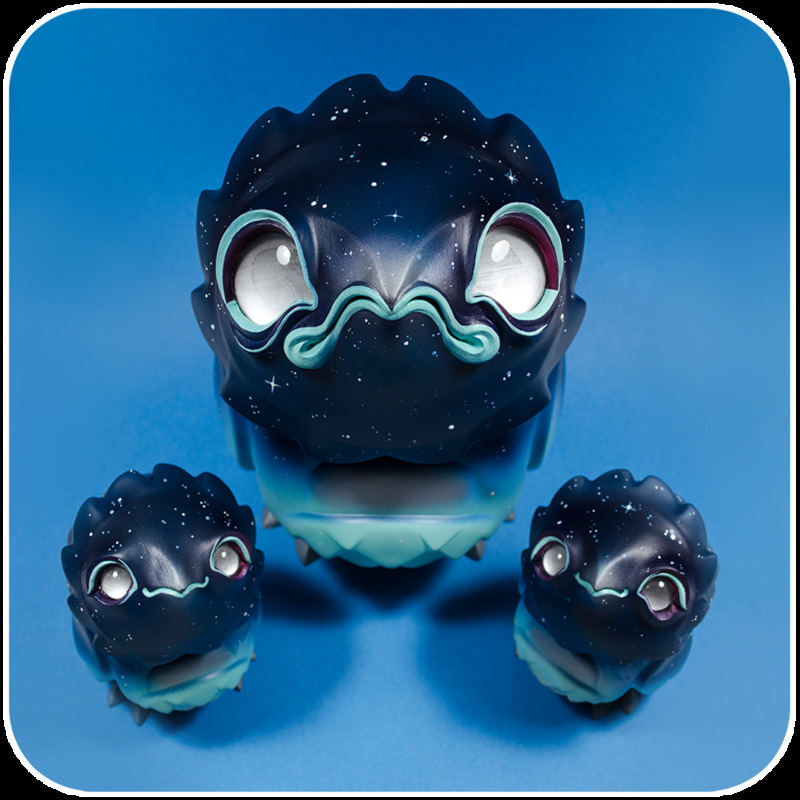 But as for now, these three are for the Monthly Custom Series over at Collect & Display! Woho! So who are these guys then? They are the Bulli-Corns! And what is a Bulli-Corn you might want to ask?! Let's just say that they might be the softest and cuddliest magical creatures on the planet. However their magic don't work unless they feel loved and get at least 50 snuggles a day, and that is just the minimum. Really the Bulli-Corn want's to be close to you 24/7. So before you adopt one make sure you can give it all the love it requires or he might just simply fade away. But it's now like you can resist those snugly creases and chops anyway, is it? Now this, this is my favorite toy so far this year. Literally one day after I said to my other half that I would love to work on a Bearhead from Luke Chueh my PM on IG pinged and there was Cory from Strangecat Toys asking me if I wanted to take part in his show "Bearly, a Custom Toy" in September. And guess what the chosen platform was?! YES, a Bearhead!!!! I wanted to create something mystical and extraordinary and I think I did. I am happy I sketched this out on paper first or I don't think the end result would have been as good. I also chose to paint the eyes myself as I couldn't find anything suitable. I will be doing this allot in the future. Imagine all the possibilities! The easiest part was the head. The wooden base took some time and some planning. I built the base out of foil to get the right shape around the head and then stabilized it with epoxy. Wood is so forgiving to sculpt as it has got no rules or boundaries. You can just do whatever you want with it. I did the base in three different parts so that I could paint them separately and then assemble them after. This was to achieve a more professional looking paint job. It was almost like making a puzzle. So hard to get all the pieces to match. But as you can see, it all worked out fine. 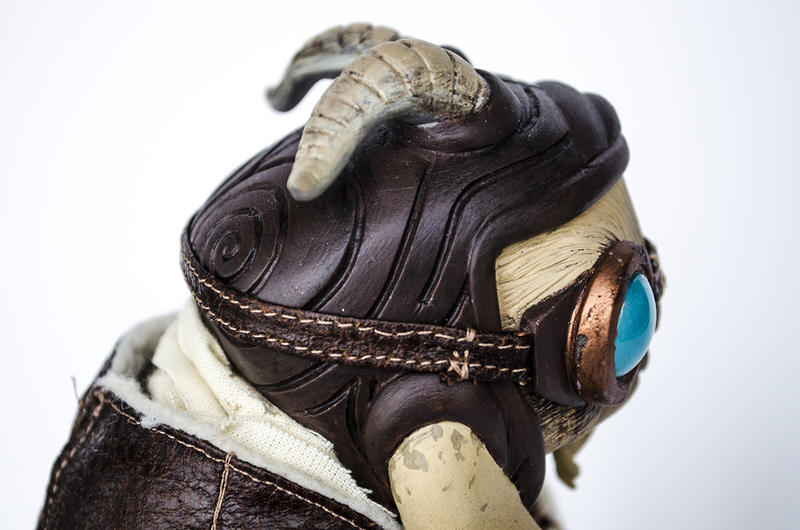 Now I ended up using just over 1 lb of Sculpey on this sculpt.... Yes that is allot, and as you can imagine this toy weighs quite a bit. 1.5 KG to be exact. It's the heaviest and biggest toy I've ever made. 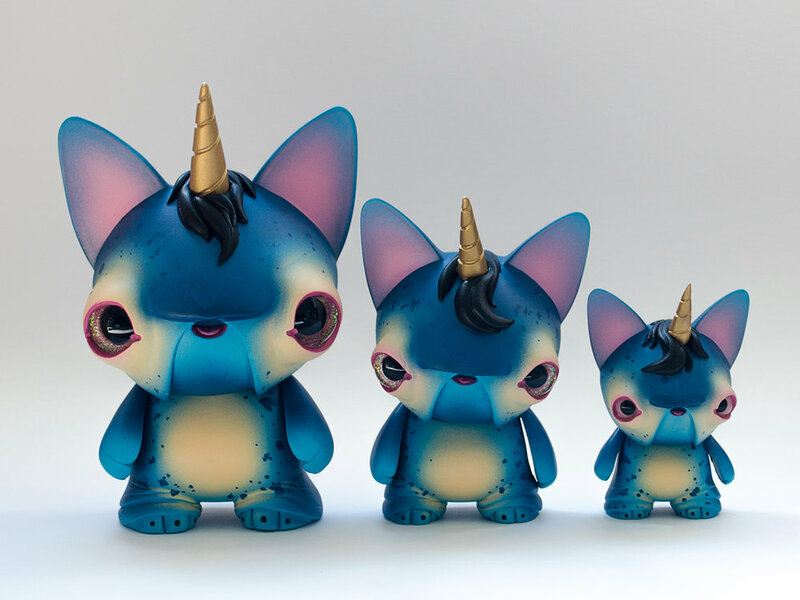 "Reborn" will be showing at the "Bearly, a Custom Toy Show" by Strangecat Toys at Redefine Gallery, Orlando, FL on September 2nd and 3rd 2016! 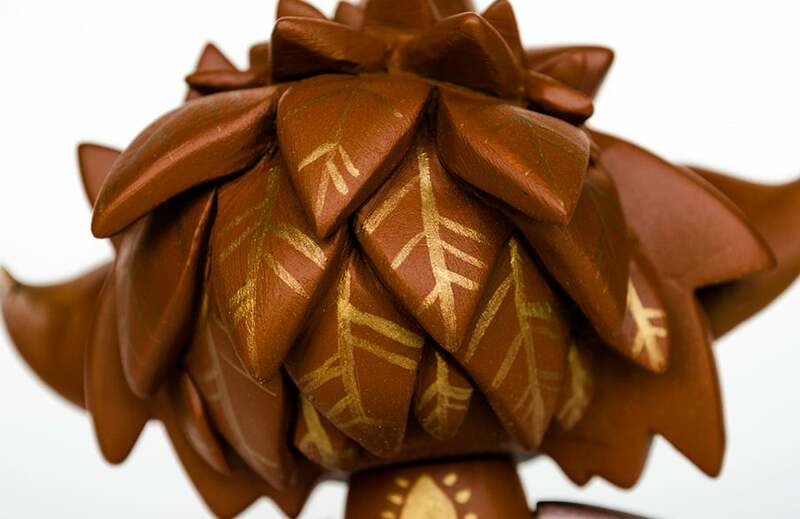 And I can't wait to see all the other customs for this show. The Bearhead is for sure one of my most favorite platforms so far. Absolutely Amazing! So make sure you don't miss out on this one! 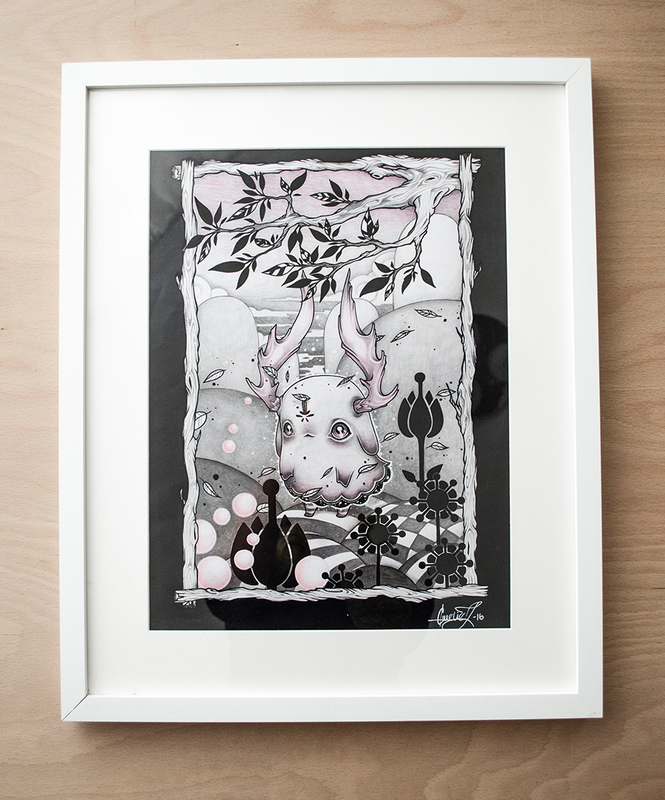 It is time for my second appearance at Clutter Gallery this year! And I felt so honored to be invited ones. Now twice! And with TWO pieces this time too. I did have the chance to do three, but I totally ran out of time in the end so two had to do. I chose this 8" Qee to work on as my platform this time. I've had this sitting in my cupboard ever since I started customizing I think. And I've had a million different ideas for it, but never started working on it. I thought this was the perfect platform for the job in hand though. It was one of those times when I didn't do any sketch before I started working on her. So I didn't know exactly where I was going. All I knew was that I wanted her to go with the artwork I had done for the show as well, so I went within the same style. She looks pretty different from what I normally would do. And I guess that was on purpose. I really wanted to try something new, or something in a different direction. And this is the result of that... A very cute one I think! I spent an awful lot of time on masking and getting that flower to stay together. It doesn't matter how fed up I get with masking sometimes though. It is always the best way to clean lines and therefore I don't mind the suffering HAHA! I enjoyed working on the Qee, it is not my fave, but definitely nice. It is always good to work on a platform that is meant for DIY. They come apart so nicely and you can put them back together very easily. Why it's not one of my favorites is that it just won't leave much room for your imagination, it is a bear and yeah..... that's that. It is super cute however and I did enjoy the experience. Now this is super exciting as I've never had an actual 2D art piece in a gallery before and I am so proud and excited about it! For those of you that follow me on IG you have seen quite a few sneak peeks of this one. I worked on it over my holiday in France. And I think that the feeling I had in me through that whole holiday translated pretty well into this picture. I could've spent the rest of my life on that patio. I haven't felt such peace in my soul for a long time as I did there. But there we are. Life at home have to continue as well, and I am back now, well rested and with allot of energy and new ideas! Ori - 14" Custom "Bode Broad"
This is Ori! My first fully human custom! I did do the Space Crab last year that had a human face but this is the first full body human I've done. It has really been something! I don't want to send her of to her owner hahaha! I've been working on her for about a week, even though I started roughly two weeks ago. I had a few things to finish in between. She was a "Bode Broad" by Mark Bode originally and I have seen quite a few of these Bode Broads popping up around IG. To be honest I wasn't a big fan of the original toy. Not until I had her in the post and got to hold her in my hands and have a good look at her. This toy is so well sculpted and something you can't appreciate in a photo. Every curve in her body is perfect and she is so well weighted. Even though she was well sculpted there were many bits that wouldn't work with the style I wanted to go for. I had a long an hard job in front of me. Cutting her drape off was the hardest part! I decided to keep it at first but as I went along it was just getting in the way. So I brought out my dremel and started hacking away at it. At this point there was no turning back and I just had to go with it. Little did I know of the massive lump of resin that was sitting in her feet. I nearly killed myself getting that out but I won in the end. After this I had to re-sculpt her legs which took me an age. If there is one thing I've learnt over the past year, it is that nothing will get in my way of achieving what I want when it comes to customizing. Do you know how hard it is to sculpt ears? No?! I do! LOL! :D It is hard. And what is even harder is to get them somewhat symmetrical. Symmetry is the bane of my life. I am addicted to it! To sum it all up this have been majorly challenging but an absolute blast! I've been wanting to do something like this for a long time so when I got asked for a Bode Broad commission I jumped at the opportunity! 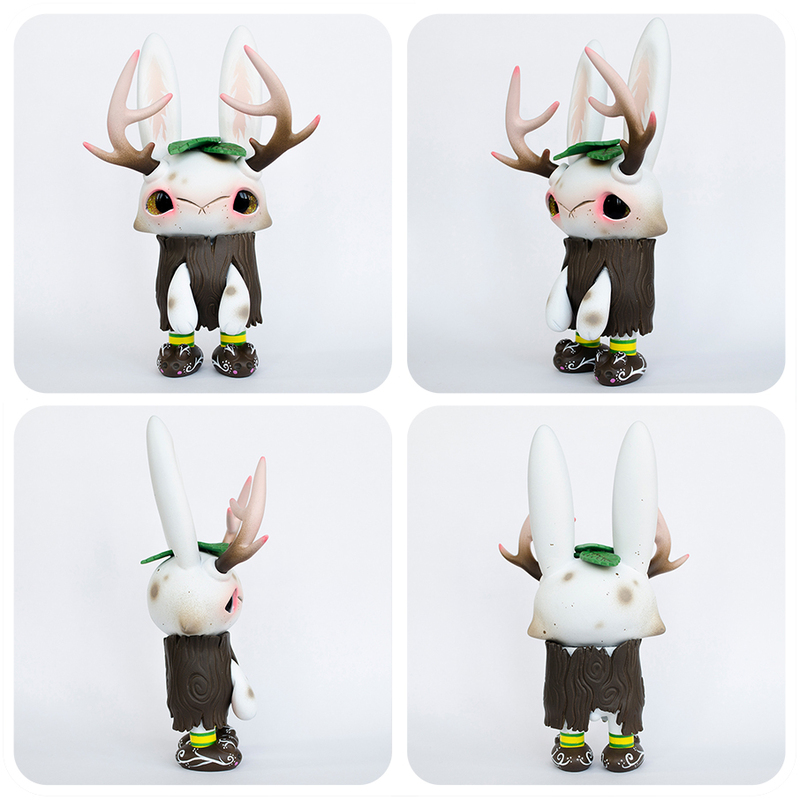 I really want to design my very own Pinup Vinyl Toy one day! That would be a dream come true! I've got so many ideas and a much better understanding of it now. What an awesome piece of vinyl!!! Thank you for letting me work on this pure piece of beauty Josh! Just look at that face! Isn't he just the cutest?! 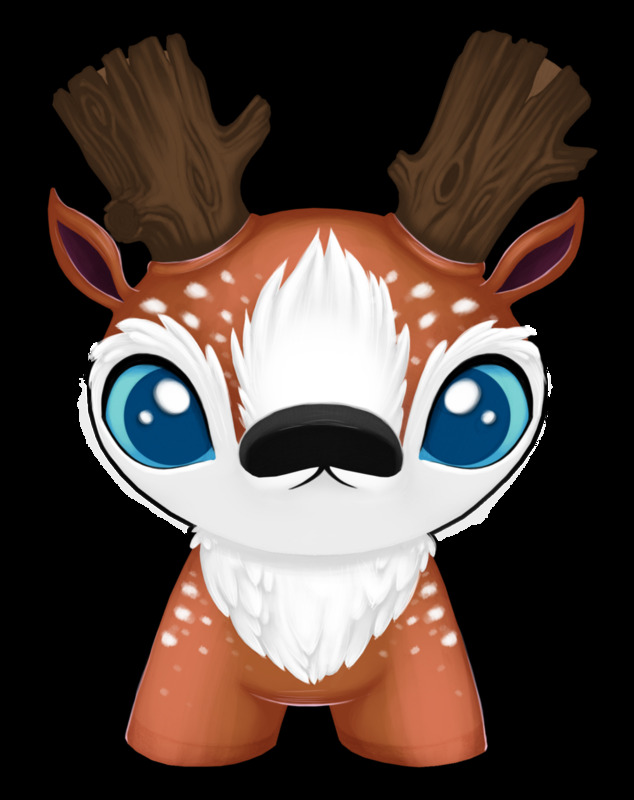 I am in love with this little guy and the Bitxitu platform. The guys at FGH Toys did such an awesome job on him and I feel very happy to be one of their chosen artists to work on it. Thank you guys! I've started working allot with gradients lately and I'm really trying to improve my airbrushing skills. I think it's getting better and I'm learning more and more for each toy I finish. The Iwata airbrush I invested in a while back have been absolutely outstanding so far, but I managed to break a part in it and then found out how freakishly expensive the little parts are.... I shall be more careful from now on! He came out so well and it will be hard to let this little guy go once it is time. I'd like to keep him forever but there we are, that is not going to happen lol. 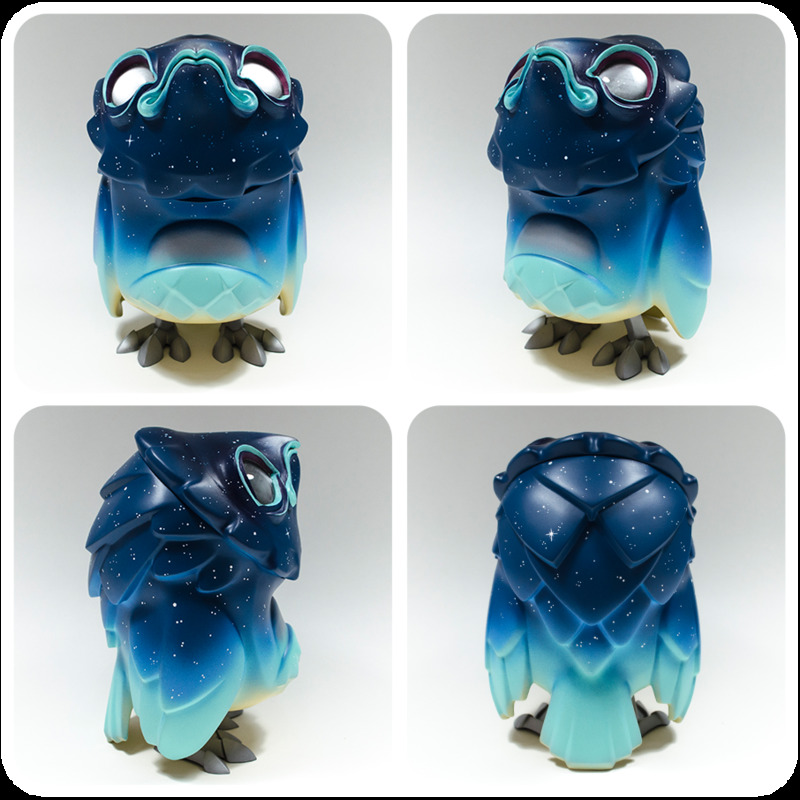 He is the first Resin custom I've worked on as well so that was a great experience. I've been a bit stand offish of Resins as I didn't know if they were safe for the oven or not, turns out that they are for short periods of time. So here's to more custom resins in the future!!! I don't know the exact release date yet but it will be sometime in the first week of June, so not long. I will keep you posted on IG! He will be available from the FGH Toys Bigcartel however and I don't know the price just yet either so yet again I will keep you posted on IG. Here it is! 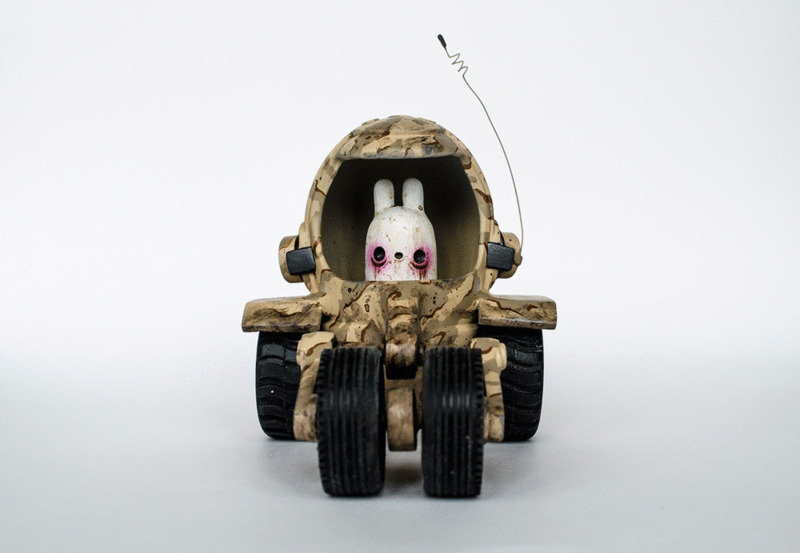 My finished Bedtime Bunny for Peter Kato and Clutter Gallery! First of all.... I feel so privileged and super happy about the fact that I got invited to a show at the Clutter Gallery. This is something I've been hoping and waiting for ever since I started customizing. So you can maybe try to imagine how excited I got when this invitation showed up in my inbox. The fact that it was a Bedtime Bunny from Peter Kato only made it better. 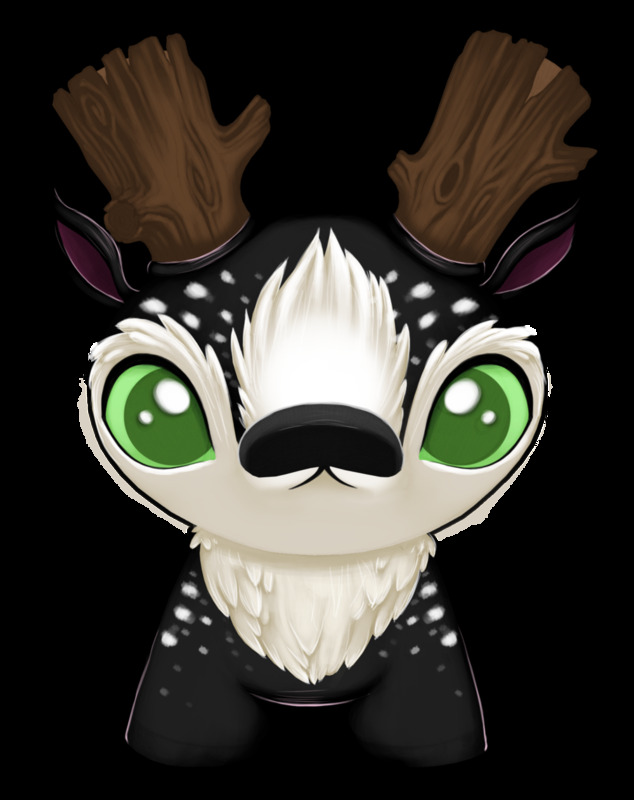 His cute style goes so well with mine and I had no trouble coming up with this little Jakalope Bunny creature stuck in a log. I got some cool leaf cutters a while back and decided to put those to use. I think the leaves are just the cherry on top and really made this custom come together. A week ago today I found myself in one of the most amazing places I've ever been to. ToyCon UK! I am kind of speechless over the whole thing and I wish I could re-live the weekend over and over and over again. What a place! On the Friday I set up my table after trying to make my way from Victoria to Bethnal Green with a 40kg suitcase. It nearly killed me, but I was pleasantly surprised with the Londoners willingness to help a poor girl with her luggage! It took me about an hour and a half but I made it to my hotel. I only had a few hours sleep the night before as I literally finished the last resin toy at 9.00 in the morning and my bus was leaving at 11.00. So safe to say I was pretty tired once I reached the hotel. But I had allot of setting up to do so I had a shower and some food and then headed over to the convention hall. The setting up took me forever! I have never fought so much with paper and cello tape in my life but I got it looking the way I wanted in the end lol. Didn't really talk with anyone on the setting up evening as I find it quite hard to approach people I've never met before. Just set my stuff up and then headed back to the hotel only to fall asleep at 9.30... woooops! Really needed that sleep though, but I felt really antisocial! I had so much stuff with me! More than I thought I'd be able to finish in time for the Con. But I really pushed myself and I was very happy to see it all come together on the table. To be honest I didn't realize just how much I did have until I put it all out. I felt really bad for not giving you guys a preview of what I was going to bring, I just never had the chance. So I will give you a closer look now. I think you saw from my instagram feed how hard I worked and how much stuff I actually managed to get done. I am very happy with everything that I made and in the end it was all worth it. The response to my toys have been mind-blowing to say the least. I could probably ride on this cloud of happiness forever. This Ice-Cream Dunny from Candy Cove was the first thing I sold at my booth and to be honest I would have been happy with that. So when one thing after the other just went and my table looked emptier and emptier you can maybe try to imagine this crazy buzz I felt inside. I still can't believe that people want to own my art but you make me feel so damn good. And to meet so many of you have been such an amazing experience. It's been so nice to meet all of you and to put faces to names. I do wish I had the chance to talk to many of you more than I got to do. Things were just so busy! But I do want to thank you again and again for buying my art and for supporting me and by doing so helping me to achieve a dream. A dream that is coming true a little bit more every day! 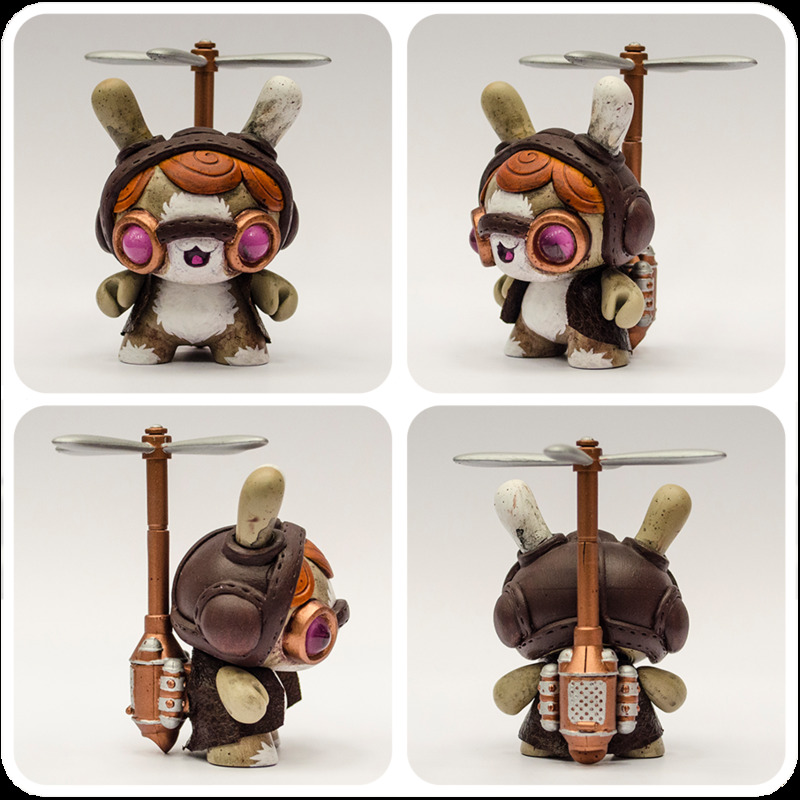 One thing I never thought would sell was this 8" Dunny. My first 8" actually and probably my favourite out of all the toys I've made. It was heartbreaking to see him go but at the same time I was super happy. I loved working on something bigger than a 3". So much room for imagination, plus the fact that it is much better balanced than a 3". I could never have put a huge lump of wood on a 3" Dunnys back without it falling over. He is a warden from the Whispering Woods. He looks after all the flying critters and foes of the woods. On his back he is carrying seeds of different sorts that he feeds to these animals. "The Golden Leaf Tribe persists of a group of fox like creatures and is located deep in the Whispering woods. Some say that these creatures guard the very heart of Tomodachi Island, in the shape of a golden glowing leaf. However no one knows for sure as nobody will get through the force barrier that the tribe have created around the heart. They are gentle creatures, but they have sworn to always protect whatever it is that they protect, with their lives. You often hear their hymns echoing through the forest and it brings calm to all who live within the Whispering Woods." This is Gorudo. Not much is known about him as he along with the rest of the tribe tend to keep to themselves. All we know really is that he paints his body in different golden leaf patterns and that his hymn is one of the most beautiful we've ever heard. Gorudo sits on a 4" Nakanari Spiki platform. He's been airbrushed with acrylics and carefully finished with a fine brush. He's got fine golden touches on the back of his head and down his back. 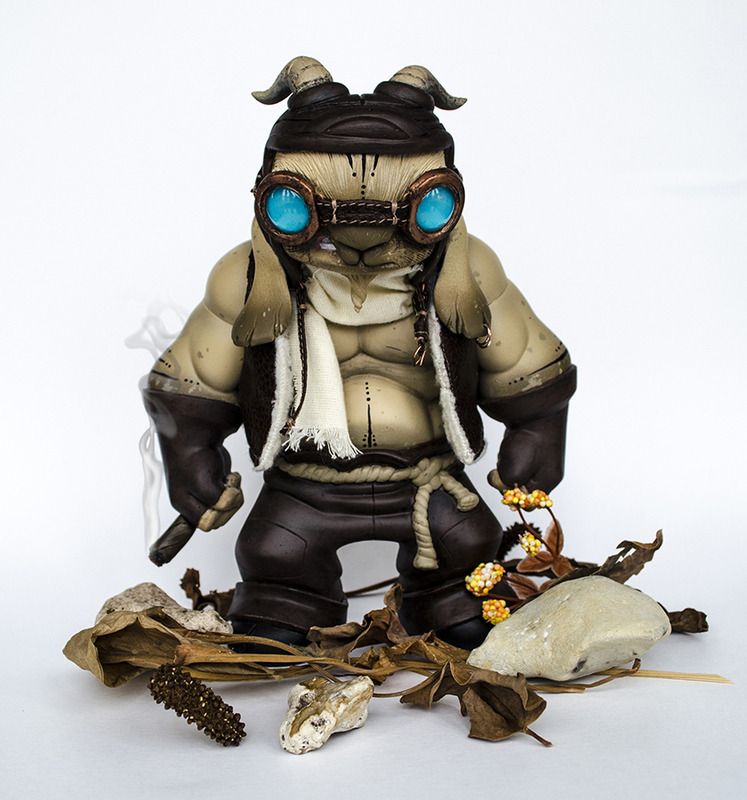 Gorudo will be for sale this coming Friday the 15th of January from my BigCartel store at 21.00 BST. £100 with FREE UK shipping. You can find a preview HERE! This is Gin. Just like Gorudo there is little we know about her. All we know is what we've seen from a far and on pictures. She seems to be very obsessed with her hair and she likes to decorate it with silver streaks. In general the members of the tribe seem to be very fond of metals like silver and gold. Gin sits on a 4" Nakanari Spiki platform. 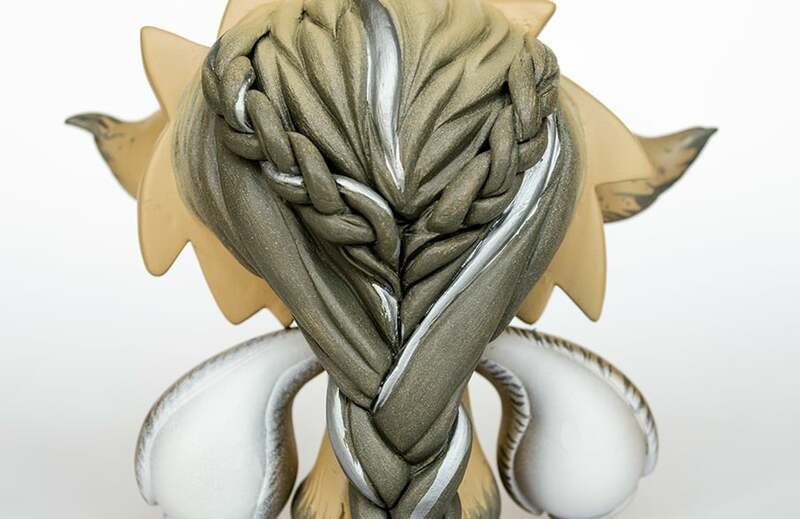 She's been airbrushed with acrylics and carefully finished with a fine brush. Shes got silver streaks running down her hair and a small silver leaf on her forehead. Gin will be for sale this coming Friday the 15th of January from my BigCartel store at 21.00 BST. £100 with FREE UK shipping. You can find a preview HERE! I've worked very hard on both of these little fox creatures and spend many many hours on sculpting their features and especially the hair on both of them. They will be the last toys for a little while besides from a few commissions that I still have to finish. 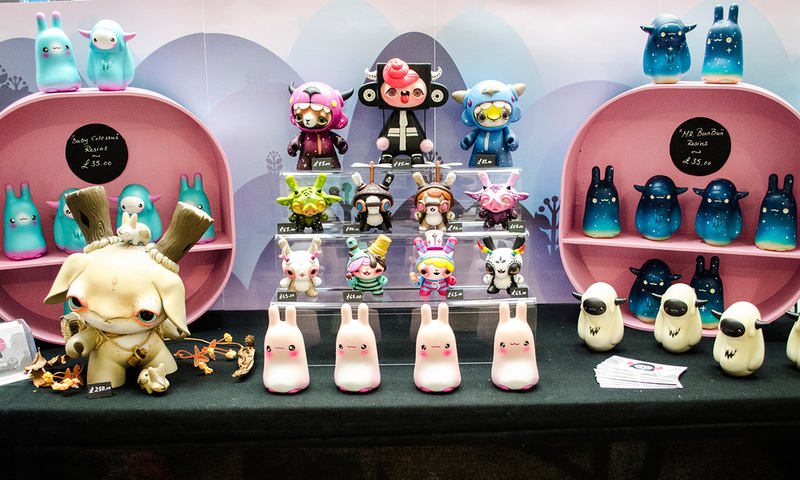 I need to focus on my stock for ToyCon UK now and I can't wait to get started. I've got allot of work to do, and I hope I will be able to pull it off. I am extremely excited about going to ToyCon UK and I want everything to be perfect! You will see many new and exciting things happening here this coming year. 2016 will definitely be a very good year! And starting it off with these two that I'm very very happy with feel very good. Say Hi to Goo-Jo! 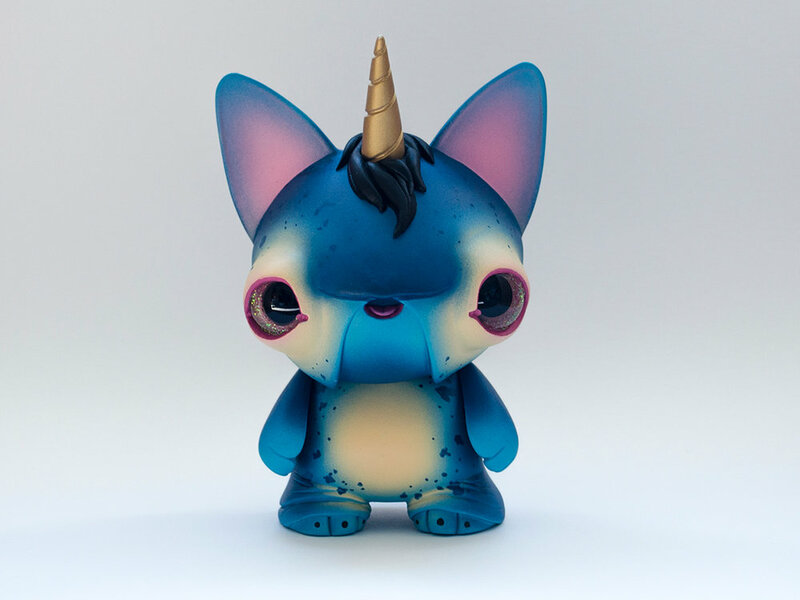 My very first Muttpop Tequila custom. He's a commission for Josh who read one of my comments about how I really wanted to customize a Tequila and so he contacted me and sent me one! How awesome is that?! I was over the moon of course and I still am. What an awesome platform this is. It is so well sculpted and the pose is just magnificent too. Now Goo-Jo is a bit tougher than what you're used to seeing from me. I tend to work with cute most of the time. But after doing the Space Crab I've been so eager to try out new grounds and yet again I was given a platform that gave me a challenge. I'm sure I could have turned him into something cute, but I didn't want to. And I kind of am in a Steampunk mood at the moment as well, which I haven't been for many years, so I am trying to apply that to the things I am working on at the moment. 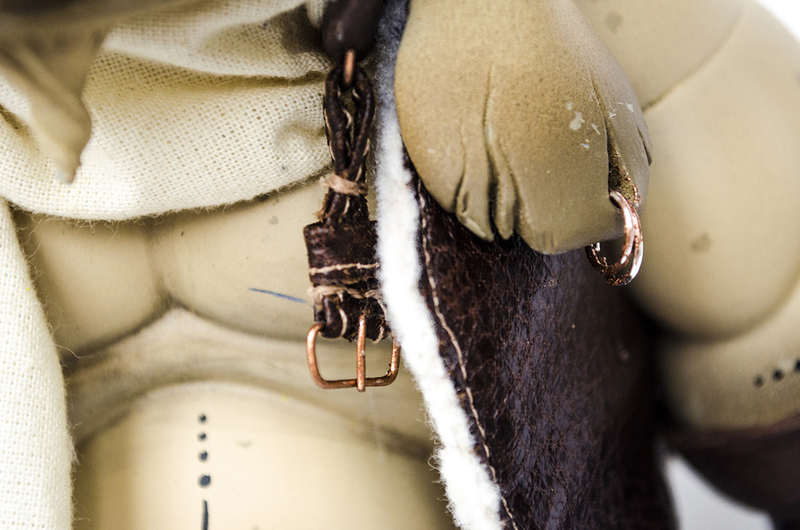 The biggest challenge with Goo-Jo were the textile elements and the metal ones. Instead of sculpting I decided to give fabric, in this case leather, a go. I am pretty used to sewing but making clothes for models is a whole new spectrum to me. So after allot of fiddling and no patterns, no I had to sew it all on to him lol, I finally managed to make him a jacket! And the leather straps too. I also engraved the helmet with my Dremel. That took a while and was probably what took the longest too. So here's to another successful custom and to great people like Josh who gave me the chance to work on this amazing fella. Thank you Josh! My biggest project so far is finally finished! Or maybe not biggest but definitely the longest. 7 long weeks it's taken me to finish this beast. It's not even big but the task was a beast. The Space Crab Wars is the first show I was invited to and from the second I had the invite I knew I wanted to make something very special. I know that it is a good idea to stay within one set style as a designer. But if I can't progress in my work then I see no point in creating, so I really wanted to step out of my box and do something out of the norm. The Space Crab platform allowed me to do so. It took me a long long time to figure out what to do with it but when it finally came to me I knew it was right. It all started with a sketch of her head in a helmet and then I just went on from there. I think the first thing I decided on was the colour scheme. I knew exactly what I wanted with the dessert cammo and the contrast of her pink hair. I like the mix of masculine and feminine and I think it softens the whole "war" theme going on. It was hard though, not to make her to cute and to maintain the masculine part of it. I did work on the paint of her face for a very long time to get it right. Now then.... This was the unplanned side of this Space Crab that I, in the end, put most of my work in to. I weren't supposed to use the helmet at all. In fact I was about to throw it out and then this thing popped up in my head. Now for some reason I didn't sketch it out, I just started building this thing without any references or sketches at all. I'm sure it would have saved me allot of time if I did plan it better. But I just went on with it. This is the first vehicle I've ever made and getting all the parts together took a very long time. All the bits are made out of Super Sculpey but as the Space Crab helmet is hard plastic it's not oven safe so I had to do the details and put the Sculpey bits together with Epoxy. Epoxy.... where do I start. 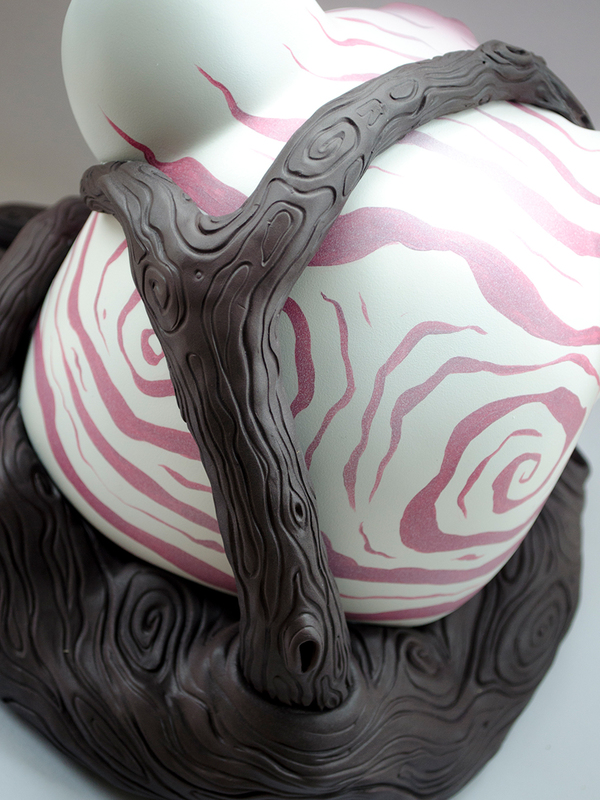 I do love it as it is extremely strong and opens up many opportunities that I wouldn't have had with just Sculpey. But it is very messy and hard to work with, plus that the long curing time just prolongs things even more. Saying that, I could not have made this little dude if it weren't for the Epoxy. So yes I have developed a little love/hate relationship with Epoxy. I also found it hard to find the right accessories for him, like the wheels. I managed to get the ones I wanted in the end, and also had to wait for them for about 3 weeks as they came all the way from China! And I'm not even going to tell you about the paint. Let's just say I had to wait a long time for that too. I completed these two customs with an enormous feeling of satisfaction! Not only did I push myself but I also feel that I've created something that I can be very proud of and I think it will be a great addition to our European Team. There is some awesome customs from my Team in general and I really wanted to do my very best to make them proud of me. I hope we take home the Victory in November as I think it would be a great achievement for the EU Toy Scene! And I want to thank Jon-Paul Kaiser for personally choosing me to be part of his team of awesomeness!!! GO TEAM EU!!!! Sign up to our NEWSLETTER for New Releases and Unique Offers!